On Wednesday last week, it was Remembrance Day. I stopped work and walked down to the Cenotaph in the centre of our village, and watched all the children from our local primary school - including my youngest two - sing their songs, read their poems, and recite the names of every man in our village who lost his life in war. Men stood proudly in their well-maintained uniforms, medals shining, flags on heavy flagpoles held aloft. The oldest, a man whose face bore every one of his years, shook each time he had to hoist or lower that flag, or put it into the pouch that held its base at his waist, and yet you could see that every moment of discomfort or difficulty was an honour to him because he was still living, and he remembered those who had gone. A boy in my son's school had, a year previously, visited the Tower of London's famous cascading poppy display and had been inspired to ask if we could do something similar at our school. All sorts of adults, from the local secondary school's Head of Art, through to our local British Legion representative, came together to breathe life into his dream. 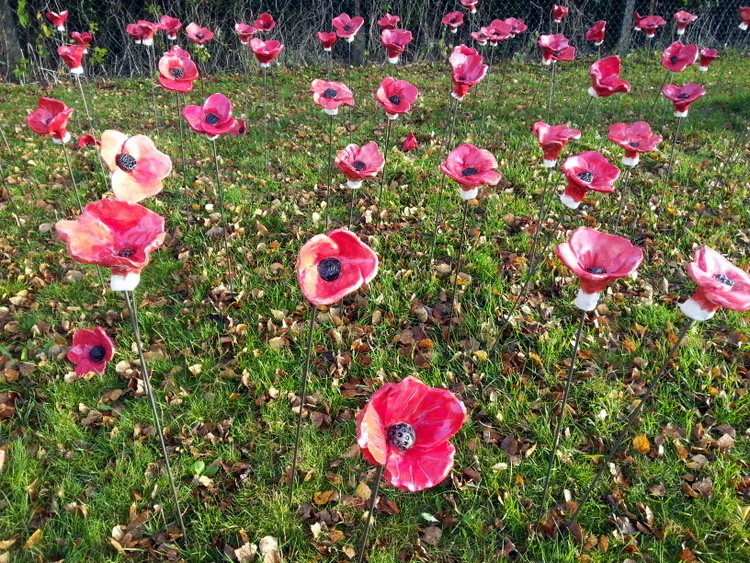 The children in the school made their own clay poppies, glazed them, fired them, and on Remembrance Day they became a field to the side of the walkway into school. I see them four times every day, in all weather, and they still stand proud a week later. They remind me to remember, and that is so good. And then Paris happened. It happened on the same day we remember the birthday of my oldest friend's lost mother. And both those things together: the senselessness of loss, the cruelty of life, all the very best and very worst of humanity laying itself bare... it made me need to write here again. It made me need to say: I remember. I remember those soldiers from more than a century ago. I remember the innocents of Paris, of London, of New York and everywhere else touched by vicious violence. I remember the refugees from Syria, that boy on the beach, the faces of those mothers as they stepped onto Greek islands. I remember Jenny, my friend's mother, who was so, so alive and taken so fast and so unfairly. And I choose. I choose not to let all this bring me down: because everyone who died wanted to live, I know I must choose to live fully. To love my family and friends not just in my heart but in my actions. To grieve what's lost and then, on a new page, write a future. I choose to step forward into life with the steps they wished to take. I know it's hard to feel like there's anything we can do to help after Paris. Those of us with neither the finances nor the power to help the victims or catch the perpetrators feel impotent. But let me tell you: we are not. We have seen the power of the internet to influence others in the name of hate and murder. But through the internet, we have the power to spread happiness, purpose and goodness too. And through life itself. If I raise my boys with love, with kindness and compassion, they can become three men who neither kill, maim or destroy. If I live my life as fully, richly and honourably as I can, I am one more person who hasn't been beaten or broken by the evil in the world. We need more children to grow into good people, and more people to live in the name of peace, kindness and happiness, and if we can do that, add all those people up and we make such a difference. This week I have a doll to sew. It may seem a frivolous thing to do in the light of what's happened. But it is my way of living the good in life, of living my values, of bringing happiness to others. My little niece may grow up to love it. It may brighten your day to see it here. And sewing it, for me, is an act of love for my family, and of filling my life and soul with everything that is the opposite of what those vicious men did in Paris. Making the world good starts with making our own lives good.